Is it possible to create a trapezoidal button like in the pic above? 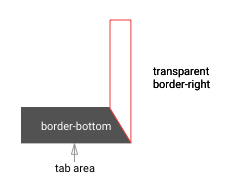 I searched the web but couldn't find any solution that shows the border. Edit: Seems my question wasn't clear or just wasn't understood enough. Anyway, the other threads just show how to create a trapezoid by joining 2 elements, but how do I add border on that? PROS: very minimal styling and very easy to understand. PROS: very customisable; can add border to tab, can add gradient background to tab. 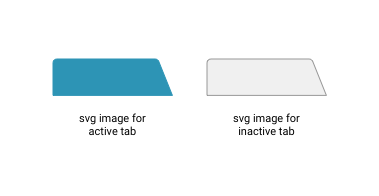 CONS: requires basic knowledge on svg. for normal tab: stroke=\"#979797\" fill=\"#F0F0F0\"
for active tab: stroke=\"#2D94B5\" fill=\"#2D94B5\"